If big, liberal cities can't adequately fund their transit systems, what hope does anywhere else have? New York Gov. 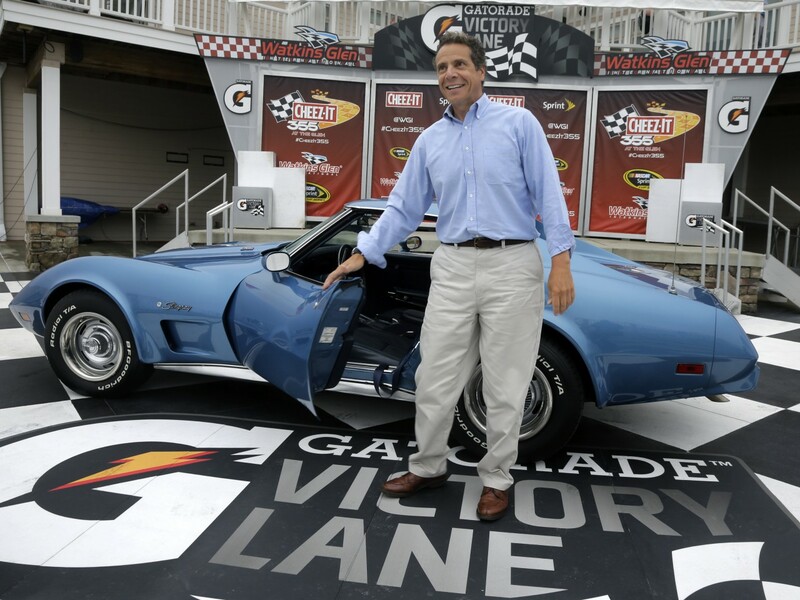 Andrew M. Cuomo gets out of his Corvette after he took a lap of The Glen race course before practice for a NASCAR Sprint Cup Series auto race. If you want to know why mass transit is doomed in the United States, look at the place where it is undoubtedly more successful — and more widely used — than anywhere else in the country: New York. In 2008, Michael Bloomberg proposed congestion pricing for Manhattan’s inner core, proposing an $8 charge for most passenger cars, to be charged only once a day. The money would’ve gone to the MTA, to fix up subway stations, improve bus and subway service, and help pay for extensions to the system. Naturally, it died in Albany without even coming up for a vote. Now, famous transportation expert “Gridlock” Sam Schwartz is trying to sell a new congestion pricing proposal, one that simply adds tolls to bridges entering Manhattan, and that also lowers already existing tolls on other area bridges. The proposal is designed to alleviate the (misleading) class-based argument against Bloomberg’s plan, which was said to benefit rich Manhattanites at the expense of the blue-collar outer boroughs. Richard L. Brodsky, a former Democratic assemblyman and a senior fellow at the Robert F. Wagner Graduate School of Public Service at New York University, said Mr. Schwartz’s plan was “a fundamentally regressive tax,” even if equity problems among the boroughs were “addressed to an extent,” at least compared with the 2008 plan. As StreetsBlog explains, this is a very silly argument. Drivers are, on average, richer than non-drivers. Owning cars is expensive, even without East River bridge tolls. There are more car-less New Yorkers than drivers. But the drivers earn more, and we all remember how American politicians only respond to the desires and preferences of the wealthy, right? The congestion pricing argument has always taken place, rhetorically, in a bizarre alternate universe where everyone drives, and where every citizen deserves to be able to drive without bearing anything close to the cost of that driving on the city’s infrastructure and atmosphere. In 2008, politician after politician cried that it was unfair to ask anyone to pay money to go from one of the city’s boroughs into another, and no one reminded them that every single subway rider has always been forced to pay to do that very thing. The sad thing is that Cuomo’s refusal to support the proposal wasn’t remotely surprising. Cuomo has never evinced any concern at all about his state’s mass transit system. Indeed, he has sometimes seemed actively hostile to the idea of adequately funding, let alone expanding it. He has blocked efforts to even study transit options on the replacement Tappan Zee Bridge over the Hudson River. He vetoed a bill that would’ve discouraged the state Legislature from diverting transit money to other things — which Cuomo did in his 2013 budget. Cuomo isn’t at all unusual. In New York state, as in the country as a whole, more resources continue to be spent on drivers and roads than buses and trains. One transit blogger has calculated that, according to how Albany allocates transportation money, “every driver is worth as much as 4.5 transit riders.” And while Mayor Bloomberg’s administration has a generally very good record on transit, there’s always been a strange tension between Bloomberg’s pedestrian and bicycle-friendly Department of Transportation and his NYPD, which has a bizarrely antagonistic relationship with bicyclists and which rarely — as in almost never — prosecutes reckless driving, speeding, or accidents leading to the death of pedestrians. This should be the most transit-friendly government in the country. A majority of New York citizens rely on public transit for their livelihoods. The city and state are run by Democrats, many of them among the most liberal in the nation. Our incoming mayor, Bill de Blasio, ran as a left-wing populist. But incoming Mayor Bill de Blasio is a driver. 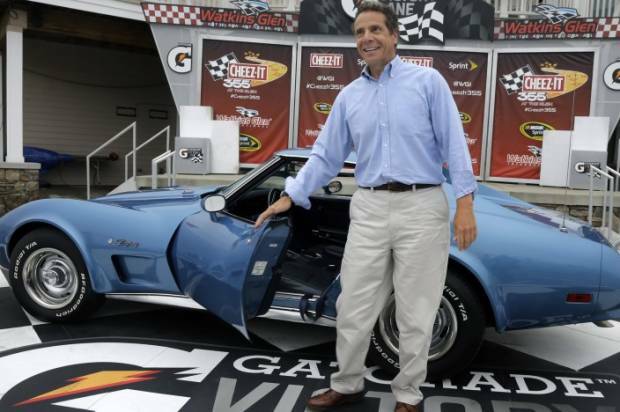 Andrew Cuomo has been a driver, or had drivers, his entire life. There are certain richer Manhattanites, accustomed to walking, for whom anti-car policies improve their quality of life, but for most of the political class, everyone they know and interact with owns a car. Finding a steady and sufficient revenue source for the local transit system, one that can’t be raided for other purposes and that doesn’t rely too heavily on burdening its users with hefty fare increases, should be an urgent priority for local politicians, but most of them simply don’t care. We already have a political system in this country that, nationally, heavily favors the interests of the rural and the suburban over the urban. Many state legislatures have similar biases. But when, even in New York, politicians ignore transit, because they don’t know or interact with or receive checks from people who rely on it every day, there’s almost no hope for cheap, efficient mass transit options anywhere. Take Minneapolis, a decently dense city that could, and ought to, support a much more extensive mass transit system. The existing system, mainly buses and a light rail line, with more lines planned, is operated by a division of the Metropolitan Council, and, predictably, the council designs transit in a way that reflects the ostensible needs of the entire metro area, including suburbs that sprawl out miles beyond the city center. The result is a series of ambitious plans to build rail lines traveling from outside the city to downtown, while the urban bus system is unreliable, neglected and nearly impossible to navigate without extensive prior knowledge. Meanwhile, the light rail lines the council and the state are pressing forward with have been designed in a bizarre fashion, along low-traffic, low-density routes and ignoring the most dense and highly trafficked corridors in the city. The city government is now fighting with the council over its plan to put a streetcar line on one major urban avenue. The streetcar is probably not as good a solution as either improving bus service, on the cheap side, or creating a real subway or light rail line, on the more expensive, but it’s the only proposed transit expansion right now in the area designed to serve people who actually live in the city. Here, again, politicians don’t ride the bus, and likely know hardly anyone who does regularly. If this very liberal town, in a liberal state, run entirely by Democrats, has so much trouble creating and maintaining a decent mass transit system, what hope is there for the rest of America’s cities? Especially the ones in states, and metro areas, that aren’t so liberal. Take poor Atlanta, where the baseball team is in the process of becoming the only MLB team to move farther away from the city core in decades. The Braves will be going to suburban Cobb County, a rich, white, conservative county that has always rejected the expansion of the local rail line into its community, citing fears of unnamed “people” from Atlanta. The current stadium is a 25-minute walk from mass transit. The new one will be essentially unreachable — by design, because sometimes transit expansion is blocked not just because of neglect, but also to enforce racial segregation.